Transparency Market Research (TMR) in one of its recent research offerings analyzes the global boswellia market to be fairly consolidated, with key market share held by large players in the market. The stronghold of established players is restricting new entrants to garner share in the global boswellia market, adds the report. Nevertheless small players operate in regional markets and serve the food industry locally. This shapes into clear majorities of large players in global markets, and that of small players in regional ones. Key players operating in the global boswellia market include Sabinsa Corporation, Arjuna Natural Health, PLT Health Soultions Inc., Nutra Green Biotechnology Co. Ltd., S.A Herbal Bioactives LLP, Alchem International, Gurjar Phytochem, and Alpspure Lifesciences Private Limited. According to the TMR report, the global boswellia market is likely to rise at a CAGR of 4.2% between 2018 and 2026. At this pace, the market is likely to be worth US$119.1 mn by 2026 increasing from US$85.9 mn in 2018. Application-wise, incense displays the leading demand for boswellia over the forecast period. Earlier, in 2018, the incense segment held the leading 60.9% share among other key application segments of the boswellia market. In terms of geography, Europe holds a key share in the global boswellia market. This is because of a large population in the region that are attracted to foods and personal care products that are based on natural flowers and fruits. Worldwide, individuals are increasingly attracted for foods, healthcare products, aromatic products, and personal care products that are prepared using natural fruits and flowers. As individuals are recognizing the importance of naturally sourced consumer goods for good health, the demand for fruit and flower based products is witnessing an upswing. This provides boost to the global boswellia market. Derived from Boswellia serrate tree, boswellia is an herbal extract. For centuries, resins made of boswellia extract is used in African and Asian traditional medicine. Boswellia is used to treat chronic inflammatory illnesses and a number of other health conditions. The growth of food & beverage sector is boosting the boswellia market. The increasing variety of processed and packaged food preparations to serve the discerning urban consumer is serving to boost the demand for boswellia. With increasing global travel and exposure to world cuisine, today, consumers are looking for newer ingredients when ordering food in restaurants. Consumers are willing to pay high price for exotic ingredients that impart new flavors and enhanced taste to old recipes. Such changing behavior of consumer for food bodes well for the boswellia market. However, exotic nature of boswellia due to its limited availability is a restraint to the growth of boswellia market. Consequently, foods, aromatic products, and personal care products that use boswellia are expensive, which makes them affordable by a small population. 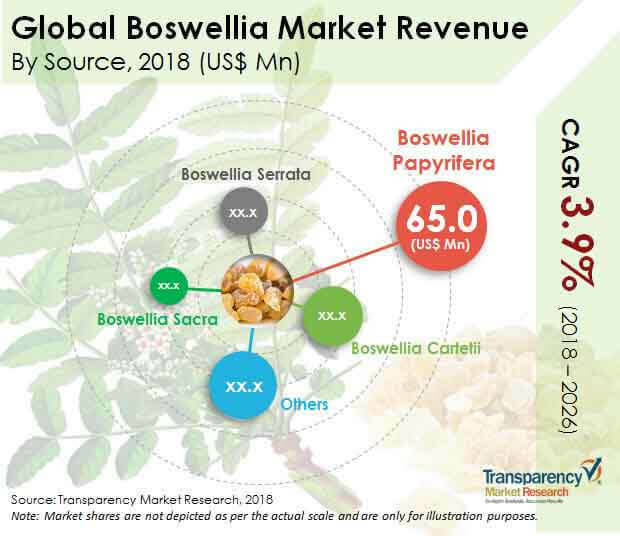 Nevertheless, increasing willingness to spend on naturally sourced consumer goods is likely to offer growth opportunities to the global boswellia market.